With the Nexus 4, Nexus 10, and Nexus 7 3G all having been announced this morning in a rather unexpected way, we're having a hard enough time wading through all the stuff currently flooding our inboxes. And in this storm of hardware, the new version of Android - 4.2 - has gotten a little lost. 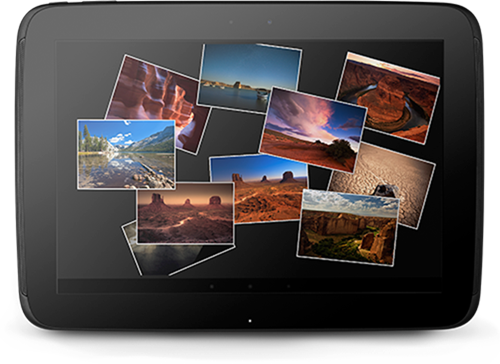 Google announced the latest iteration of its mobile OS today, as well, and it includes some pretty awesome new features - particularly Photo Sphere. We were inspired by Street View in Google Maps, and the sophisticated pieces of equipment that Google custom-developed in order to bring you 360-degree photos from all over the world – cars, trikes, and even backpacks. Photo Spheres make you feel like you’re really there. When you're snapping a photo sphere, you can move in every direction, you can look up, you can look down, every detail from the original scene is just there. Photo Spheres are stored as JPEG files, and all of the information required to view them is embedded as open XML metadata in the image itself. So you can email them, post them to Google+, put them in Google+ photo albums. Check it out and also check out all of our Nexus news. Have you ever wanted Swype, but not Swype? Google's got you covered in Android 4.2, with the introduction of Gesture Typing. It does exactly what you would think it would do: type by dragging through the letters of the word you want. It doesn't sound like much on paper, but given Swype's many loyal followers, Google was wise to implement this new input option. This is huge. 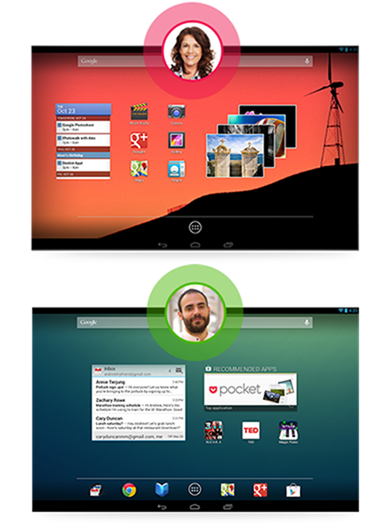 Multiple user support, on Android. 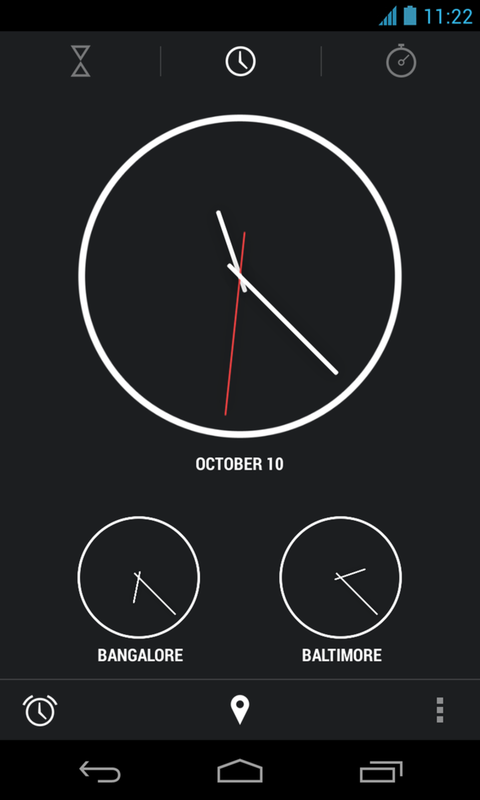 A first for a major mobile OS. Now, this is limited to tablets for the time being, but we wouldn't be surprised if the dev community grabs onto this feature and starts implementing it on phones through custom ROMs. Manufacturers, too - Samsung has to be drooling about adding this to TouchWiz's monumental feature arsenal. So, what does multi-user mode actually... do? 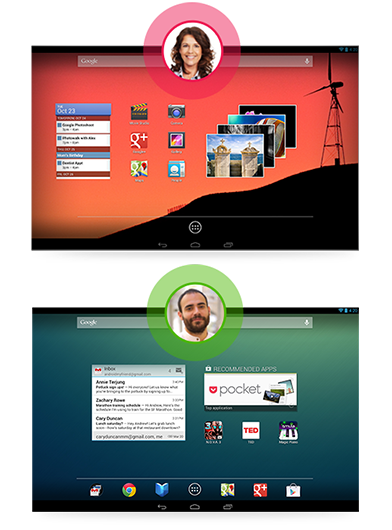 Each user gets their own homescreens, backgrounds, widgets, apps, and games - even the data associated with those apps. Which is basically what Ron already knew was going to happen. This really is huge, though. Google absolutely beat Apple, Microsoft, and pretty much everybody to the punch here. Sharing a tablet between family members is now a real, feasible use-case. Let's hope they know how to market it, because I really believe people will love this. Using a dongle (or a Miracast-ready display of any kind), you can transmit whatever's on your Android device's screen to your TV / monitor. Not too much more to say about that. File this into the "relatively useless crap" category (sorry, Android team - it is), "Daydream" mode causes your phone or tablet to display photos from your gallery, or feeds from apps like Google Currents while it's docked or idle. When the screen is on. Right. Anyway, that's what is does, and here's a picture of it doing just that. The new version of Android also has power controls in the the notification bar... but Google didn't really think that was important enough to say anything about it. You can access these controls (which allow you to toggle stuff like Wi-Fi, Bluetooth, Brightness, etc.) via a button in the notification bar, or a two-finger swipe down. 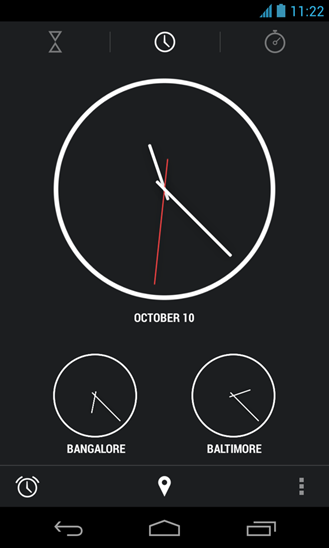 We're hearing that Android 4.2 has lockscreen widgets, as well, but right now details are pretty scant. There are no pictures on this one, at the moment, but we'll update this post with new information as we learn it. Google Now has seen improvements, as well - you can now see flight information, restaurant reservations, hotel confirmations, and shipping details (presumably this is scraped from Gmail). 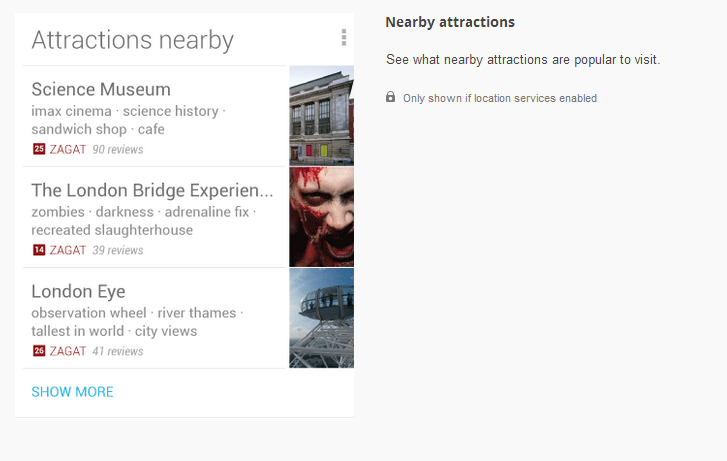 Location-aware movie times, nearby attractions, and events have also been added. 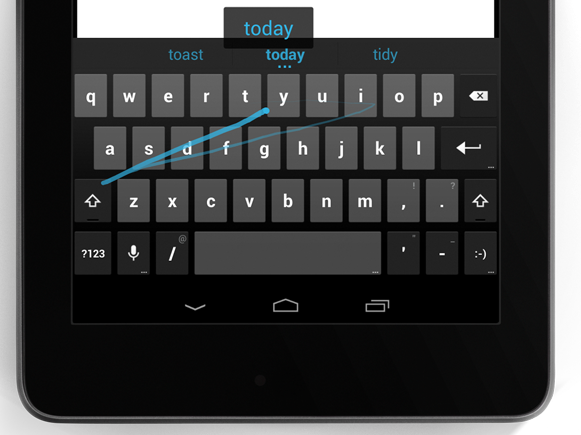 And yes, the "Swype-like" keyboard (dubbed "Gesture Typing") is part of Android 4.2, too. 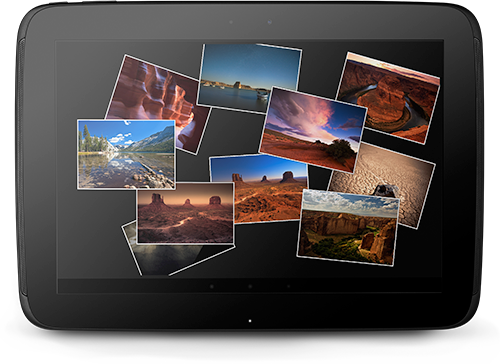 Rounding out the new 4.2 features is Miracast wireless display support. You can also launch apps via voice, as well as schedule meetings (wooooo!). Check out our post for the full details. And, to learn more about all this stuff, check out the official Android website, where many of the features are listed.